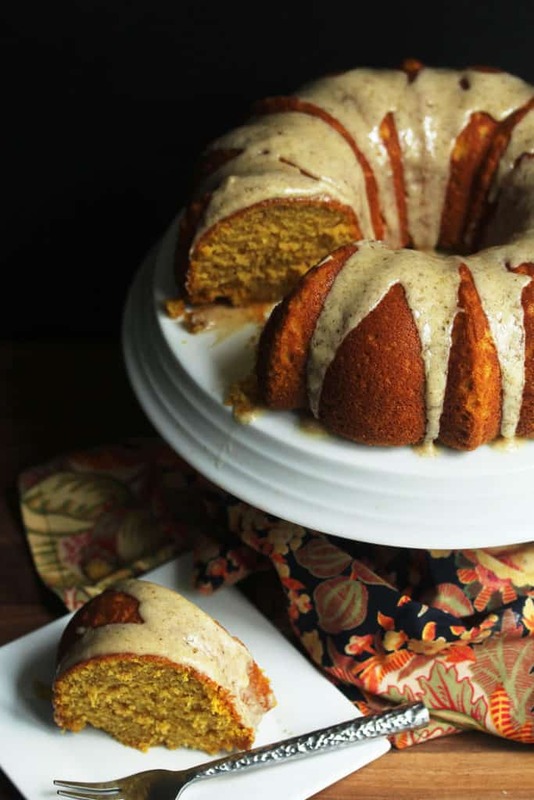 Pumpkin Pound Cake – A sensationally rich and spiced pumpkin pound cake with a to die for brown butter glaze. One of the best pumpkin dessert recipes ever! Disclosure: This post is sponsored by Safest Choice Eggs but all opinions expressed here are my own. Fall is not my favorite season, but it is one of my favorite baking times of the year because of all the wonderful fall desserts and flavors. 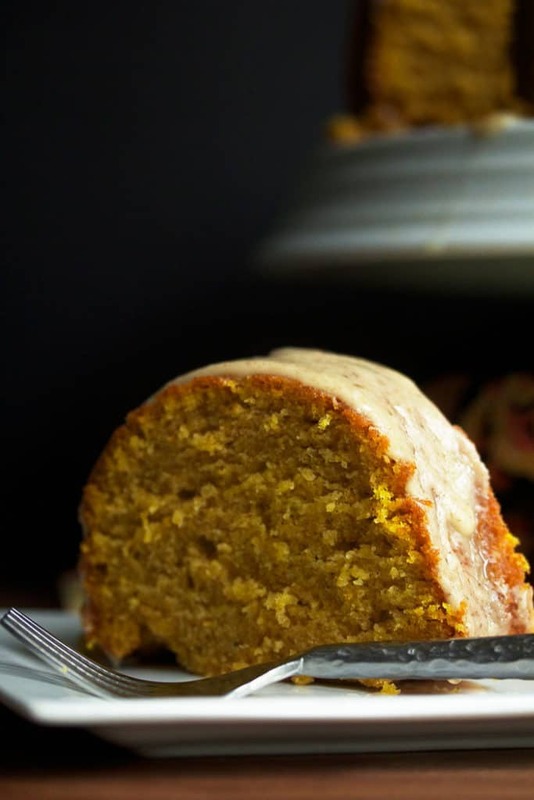 This Pumpkin Pound Cake is one of those wonderful fall dessert recipes. The beauty of it is in its simplicity. The quality ingredients shine through. I used fresh pumpkin for this, along with my favorite eggs: Safest Choice Eggs. When baking a cake, eggs are very important to the structure. They have one of the most crucial jobs of all. The egg whites stiffen the cake bringing it all together. They are like building blocks. The egg yolks are wonderful for moistness and creating a tender crumb. Generally speaking, pound cakes are simple to make, but to a novice baker, it looks pretty difficult including the pound cake glaze. I can assure any of my followers who are new to baking that this pumpkin pound cake is super simple to make and the pound cake glaze is even easier. This cake’s brown butter glaze is composed of melted butter, confectioner’s sugar and milk…that’s it! 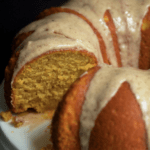 Whisk those ingredients together and you have a pound cake glaze that sends this pumpkin pound cake into the stratosphere of deliciousness and is tremendously easy on the eyes! 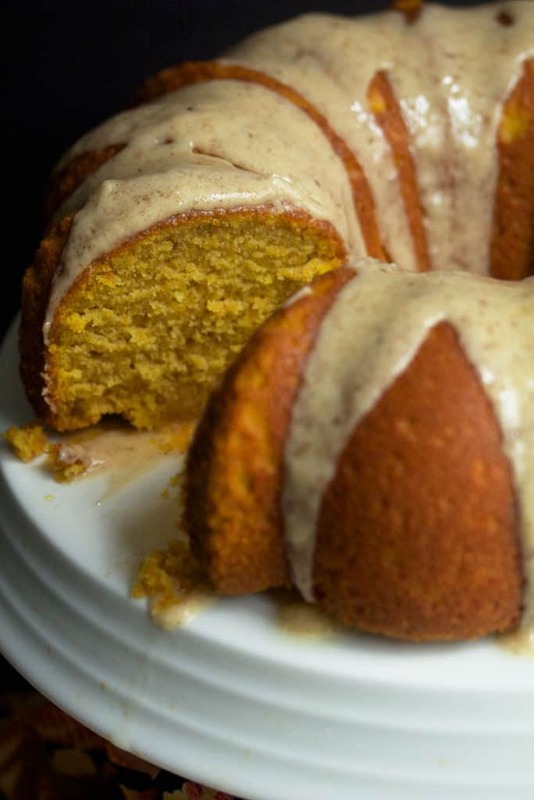 This pumpkin pound cake is simple yet its flavor is amazing. The pumpkin shines through, and the spices really help to bring out the flavor even more. Tender and moist, this cake melts in your mouth. And when you top it with my brown butter glaze, you will be humming until the cows come home! 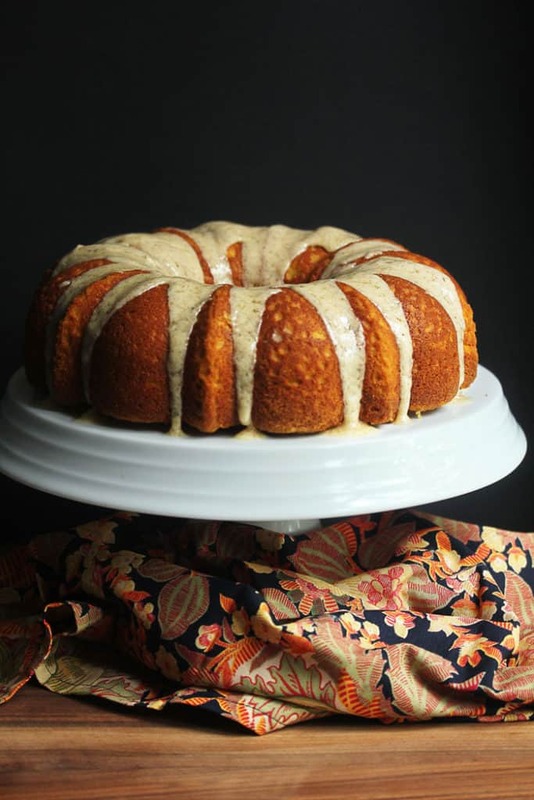 So get out that bundt pan and get to work on this pumpkin pound cake right away…just in time for Thanksgiving!! The results are well worth it. Pumpkin Pound Cake Recipe – A sensational rich and spiced tender pumpkin pound cake with a to die for brown butter glaze! One of the best pumpkin dessert recipes ever! Preheat your oven to 350 degrees and prepare your 10 cup bundt pan with shortening and flour or non-stick baking spray. In your mixer bowl, cream together butter, sugar and salt on high speed until light and fluffy for 5 minutes. Slow mixer to lowest speed and carefully add in flour, cinnamon and baking powder then add in sour cream, pumpkin and extract and cream until just combined. Pour cake batter into bundt pan and bake for 50-60 minutes or until a toothpick inserted into the center comes out moist but mostly clean. Whisk together melted butter, confectioner's sugar and milk. NOTE: Eggs are very important to the structure of a cake. They have one of the most crucial jobs of all. The egg whites stiffen the cake bringing it all together. I made this the other day and it was fabulous. I came back to make it today for a party and the eggs and the number of eggs are missing from the ingredients list. This cake looks delicious! The instructions say to add sour cream. But then it states to add “cream”. But cream is not one of the listed ingredients. Please help with this clarification. Thank you. Yes it means to mix together. Let me know how it turns out! This cake looks so, so, good. Would like to make for the teachers at my son school. Ingredients does not list how many eggs. How many eggs for the recipe. 5 eggs. Sorry for that. It disappeared which is really strange. Great looking cake!! This is a must try fall pound cake recipe. Thanks for sharing!!! I made this today and it came out excellent, exactly like the pictures! I was honestly so happy to find a pumpkin bundt cake recipe that wasn’t just a riff on the pumpkin bread recipe that it seems everyone has (you know the one: 1 cup oil, 3 cups sugar, 4 eggs, 1 can pumpkin, etc. …) This, in delightful contrast, has the texture of a great pound cake with a pumpkin flavor that isn’t overpowering. I would recommend adding a little nutmeg and ginger on top of the cinnamon, though. Also, when I made this I was surprised by the amount of vanilla in the recipe (2 tablespoons); I went with 1 tablespoon, and feel that it’s sufficient. Hi Grant, so glad you enjoyed the cake. You can make any additional spins you prefer but I love the recipe as is. I think everyone should make a recipe their own. I happen to love a lot of vanilla so I went with that. Enjoy! Just made this with sweet potatoes…BIG HIT!!! Thank you for sharing! Hooray so glad it turned out so well! Hi. Just curious.if its just melted butter why is it called brown butter? I want to make this for Thanksgiving but want to be sure I’m making it correctly. Hi Deanna, the melted butter continues to cook until it browns and turn a golden color so that’s where the name brown butter came from. Let me know if you have any additional questions. Whoa! This would be so perfect for Thanksgiving. Love that brown butter glaze! I’m in love with this pound cake. Hello beautiful! Also happy anniversary, sending big hugs your way! Happy Anniversary! What a gorgeous cake to celebrate with! And that glaze!! Happy Anniversary! Thank you for such a delicious recipe. Hope you have a wonderful day. Happy Anniversary! What a gorgeous cake to celebrate with! Im always looking for new pumpkin dessert for my Thanksgiving table and this is definitely on the list! Pinned! Great minds think alike, Jocelyn. I’ve got something similar coming out next week. Your version looks absolutely fantastic! Perfect for the holidays! Wow thank you so much auntie Rose! What a pleasant surprise to see you leave me a comment! It really made my day. Thank you so much Marcie!! That glaze is everything! This is truly stunning, Jocelyn. You go girl. It’s got to be good. Look at the wonderful list of ingredients and the inviting picture. I am ready for the taste test. Oh yeah, the taste test was fantastic in my house! What a handsome cake! That crumb looks perfect. Hi Marita, maybe try a heavier milk like coconut or use a non-dairy yogurt with some heft. Yes please! Can I have a slice? Just like beautiful bundt cakes like this!! I’m so wishing I had a slice of this cake right now! Looks marvelous. Hooray thank you so much Teresa! Happy Anniversary! What a yummy cake to celebrate with. Best of all glaze=no decorating need. Pinned! Agreed. I love when a glaze takes care of all the decoration needed. oh my goodness, that cake looks so moist and fluffy! I want! And Happy Anniversary! Girl it is indeed that! I was seriously in love with this cake. Exactly Ashley! Too hard to choose! Happy anniversary, Jocelyn! This is definitely a fun way to celebrate the best 3 years in life. 🙂 And brown butter….I’m totally sold! Brown butter is everything isn’t it? Happy anniversary, Jocelyn! This looks like an amazing cake to celebrate! Hooray thank you so much Laura! Gosh I think I will start to adopt some paleo tactics as well! But I need my sugar! Happy anniversary! This cake totally makes me think Fall…great timing. Indeed, this cake is totally fall! What a beautiful cake, love it. And big congrats to you guys! Hooray thank you so much Matt! OMG this pound cake looks super moist and delicious!!! It is so moist and amazing! Pumpkin and brown butter glaze were made to go together! This cake is perfect! I loved this cake! Thanks so much! Happy anniversary! This cake looks like the perfect way to celebrate! I agree! It was seriously so delicious! Happy wedding anniversary love! This cake is stunning and just what fall needs! Hooray thanks so much my dear! I agree! This is such a wonderful cake to make today! Happy wedding anniversary to you and Frederick!! This cake is gorgeous and delicious!! love love love the brown butter glaze!! The brown butter glaze is so addictive. Thanks so much hon!